There is a new source for firearms-related videos on the internet, GunTalk.TV. Created by Tom Gresham, the host of the nationally-syndicated “Gun Talk” radio show, GunTalk.TV offers a wide variety of videos that cover gun-handling, self-defense, and the shooting sports. On the competition side, there is a heavy emphasis on handgun comps and shotgunning. GunTalk.TV offers many free videos (but you have to submit your email address), plus a “premium” fee-based archive of longer and more sophisticated clips. Gresham has assembled a team of talented shooters as on-screen co-hosts. Clint Smith, President and Director of Thunder Ranch®, assists with many of the rifle and pistol videos, while Sporting Clays ace Bryan E. Bilinski consults on shotgunning episodes. GunTalk.TV does intend to cover F-Class and long-range benchrest shooting at some point. In fact, Gresham’s staff contacted yours truly seeking information on those sports and asking for contact info on top shooters. Hopefully GunTalk.TV will follow our suggestions. We’ve reviewed quite a few of the videos in the Free archive. In general we weren’t very impressed. The free segments we watched were simplistic, useful info was minimal, and the “facts” as stated were sometimes wrong. In the lever action segment, Gresham opines that the original lever-action rifle was a Spencer. Sorry, Tom, the Henry pre-dated the Spencer. In the video on Eye and Ear Protection, Gresham babbles on, offering platitudes such as “Guns make noise… Guns are loud.” Gresham does not explain noise-reduction ratings. Likewise he doesn’t explain ANSI impact ratings for eyewear. (He should have told viewers not to spend a penny on shooting glasses that are not ANSI Z87.1-certified). The video was poorly researched, and the host drones on for nearly four minutes. We need more facts and less “good-old-boy” talk from Tom. The 3:39 minute GunTalk.TV video on gun cleaning was also disappointing. Coached by a representative from Brownells, Tom did advocate the use of a one-piece cleaning rod, but no mention was made of a cleaning rod guide. Tom did not address solvent dwell-time or safety issues, and nothing was said about the usefulness of foam bore cleaners. In short, the video had too much superficial jawing and too little useful information. In GunTalk.TV’s video on Rifle Cartridges, Gresham makes statements that will have Fire Marshals, ATF bureaucrats, and powder manufacturers calling for his head. 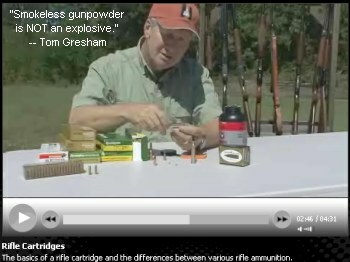 Gresham states that, unlike black powder, “modern smokeless gunpowder is NOT an explosive. It won’t blow up.” He then picks up a 1-lb bottle of smokeless powder and says: “Now it’ll burn, but it will not blow up. You could throw this can into a fire, and it’ll catch fire, but it’s not going to blow up for you, OK?”. Those are direct quotes. Smokeless powder is not an explosive? When confined it sure as heck is. But Gresham omits that key safety point. “These [smokeless] powders decompose at rates up to 1,000 meters per second and produce a propelling action that makes them suitable for use in ammunition. However, the slower burning rate of smokeless powder should not be underestimated. The explosive power of smokeless powder is extremely dangerous when confined to a small container. In addition, certain smokeless powders with a high-nitroglycerine concentration can be induced to detonate.” Source: Prof. Bruce R. McCord, Dept. of Chemistry, Ohio Univ., FBI Forensic Science Communications, IV:2 (April 2002), http://www.fbi.gov/hq/lab/fsc/backissu/april2002/mccord.htm. Gresham was obviously just talking “off the cuff”. But his statements are not just misinformed, they are potentially dangerous. From this example (and other lesser mistakes), we conclude that GunTalk.TV better bring in more competent technical advisers in a hurry. It’s good to see more coverage of the shooting sports on the web. However GunTalk.TV needs to build a better product if the show is to “catch on” with serious shooters. 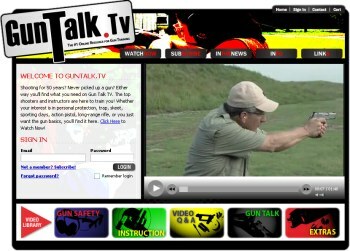 Share the post "GunTalk.TV Offers Web Video"
Are you headed to the southern hemisphere for a winter hunt? Or perhaps you’re planning a cross-country airline trip with your precious match rifles? Remington has a helpful article on Airline Travel with tips on how to safeguard your guns while complying with airline flight regulations. The well-researched article contains specific recommendations for firearms, ammunition, bows and arrows, hunting knives, chemical repellents, and even fishing tackle. The article links to the Transportation Security Administration (TSA) web site, an excellent general travel info source. The TSA maintains a regularly-updated list of Permitted and Prohibited Items. You should definitely consult this list before heading to the airport. Of course, you should also check with your particular air carrier — each airline has its own specific baggage handling regulations. You’ll find links to the major domestic airlines in the article. 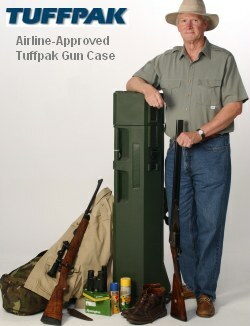 Photo: “Tuffpak” gun case from Hunters Headquarters. Share the post "Air Travel Tips for Hunters and Shooters"